OHE has a high risk of recurrence within a short time period, even if the patient has mild symptoms or is receiving treatment. Within 1 year of an OHE episode, patients have a 40% cumulative risk of another recurrence. Despite treatment with lactulose, patients who have had recurrent episodes of OHE have a 40% risk of recurrence within 6 months. 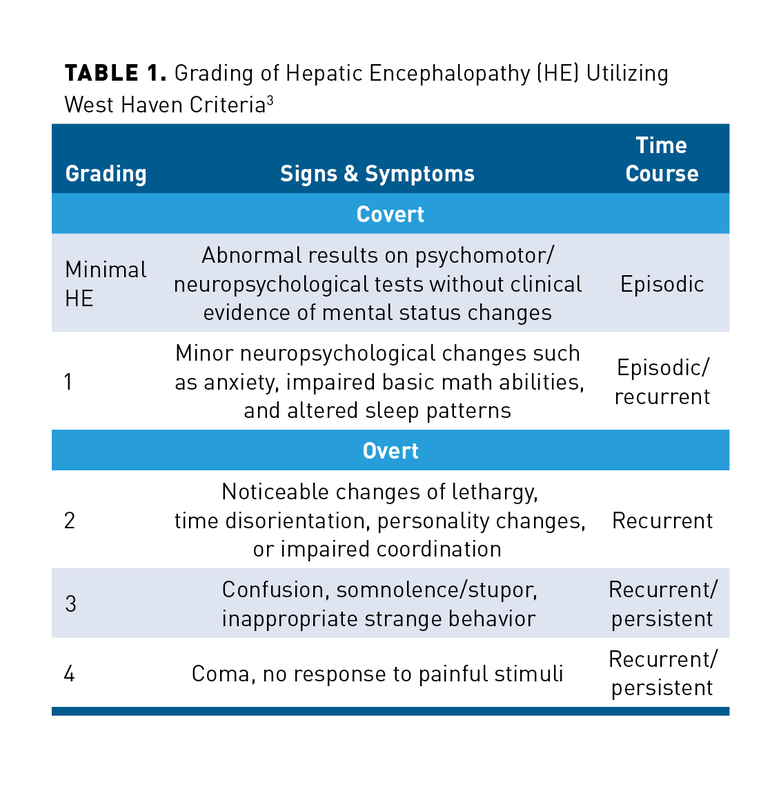 For patients with mild cognitive dysfunction, approximately 1 episode of OHE will occur for every 3 years of survival.3 With this degree of recurrence, cost-effective management becomes imperative. Antibiotics, which were historically used to treat HE, include neomycin, metronidazole, oral vancomycin, and rifaximin. The efficacy and safety of these antibiotics as treatment options for HE have been investigated. Rifaximin is a semi-synthetic derivative of rifampin and binds to the β-subunit of bacterial DNA-dependent RNA polymerase, blocking transcription and inhibiting bacterial protein synthesis.24 In a phase 3 trial, rifaximin (n = 140) was compared with placebo (n = 159) as secondary prophylaxis in patients who were in remission from recurrent HE. Patients received treatment for up to 6 months or until a breakthrough episode of HE occurred.25 Compared with placebo, significantly fewer breakthrough episodes occurred in the rifaximin group (22.1% vs 45.9%; HR, 0.42; 95% CI, 0.28-0.64; P <.001). Rifaximin also resulted in a 50% reduced risk of hospitalization compared with placebo (13.6% vs 22.6%; HR, 0.50; 95% CI, 0.29-0.87; P = .01) (Figure 125). The numbers of patients needed to treat over a 6-month period to prevent 1 breakthrough episode or 1 hospitalization were 4 patients and 9 patients, respectively.25 Because more than 90% of patients continued on concomitant lactulose therapy, in actuality, patients were either taking rifaximin with lactulose, or placebo with lactulose. Therefore, the fewer breakthrough episodes of HE and reduced risk of hospitalizations in the rifaximin arm may provide benefits over lactulose therapy alone. The incidence of total AEs was similar between the rifaximin (80.0%) and placebo groups (79.9%). 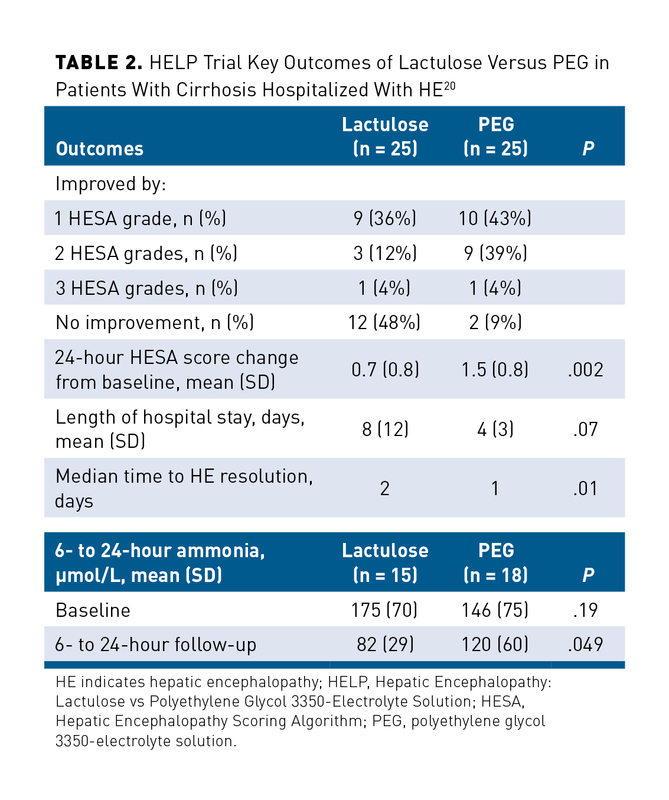 Common AEs included nausea, diarrhea, fatigue, peripheral edema, ascites, dizziness, and headache (Table 3).25 The similar incidences of AEs between these 2 groups may be attributed to lactulose therapy, which most patients were taking. Therefore, rifaximin may have a favorable safety profile because rifaximin with lactulose therapy had AEs similar to those of lactulose therapy alone. 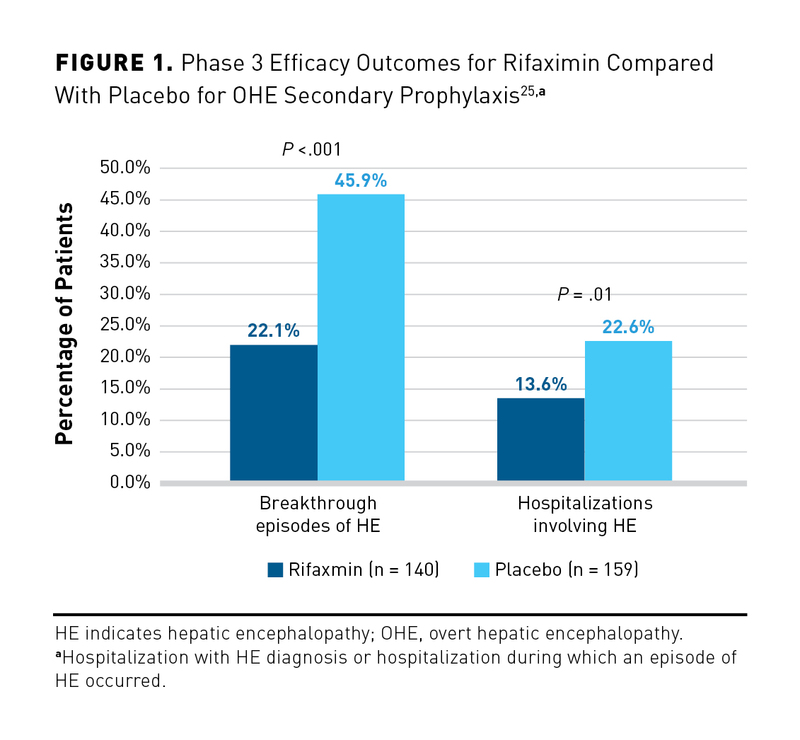 The long-term safety and efficacy of rifaximin were investigated in a 24-month open-label study of patients with a history of recurrent OHE and at least 1 bout of OHE within 1 year of enrollment. Participants were included from an earlier randomized controlled trial of rifaximin, from which historical outcomes for placebo and rifaximin groups were drawn. 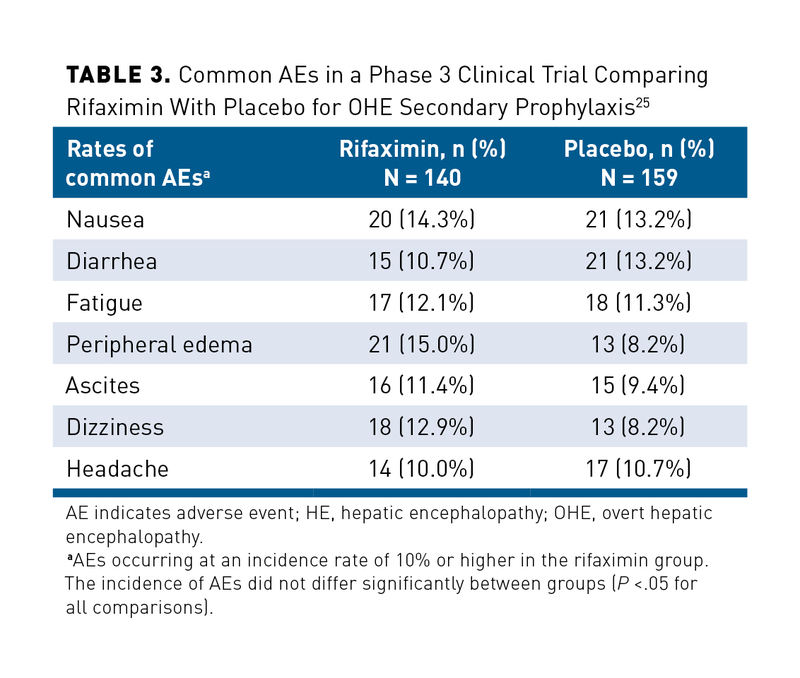 The rates of AEs during long-term administration of rifaximin did not increase from historical rates. The event rate for serious AEs per person-year of exposure was lower for patients who received rifaximin compared with historical rates for patients who received placebo (0.48 vs 1.37 per person-year of exposure).28 Similarly, the rate of mortality was similar between patients treated with rifaximin and historical placebo levels (0.15 vs 0.24 per person-year of exposure). Among patients with cirrhosis and patients with alcohol-induced liver injury, zinc is often deficient. In small studies, zinc supplementation has been shown to decrease serum ammonia levels and alter neurotransmitter levels in the brain.32 Zinc replacement can be considered for patients with HE using OTC supplements. Poor adherence rates may contribute to the cost burden associated with HE. In a study analyzing hospitalizations pertaining to HE recurrence, it was found that 40% of HE recurrences were due to lactulose noncompliance and 8% were due to lactulose overuse.41 As stated earlier, in 2009, the US incidence of HE was reported to be 115,814, with approximately 98,673 (85.2%) of hospitalized patients with major or extreme disease severity. Using data from 2009, the average hospitalization associated with HE costs $17,812 per patient. According to a study analyzing a retrospective medical record review, 40% of HE reoccurrences were attributed to lactulose noncompliance.42 If 40% of those 98,673 hospitalized patients were hospitalized due to lactulose noncompliance, then an estimated cost of $703 million was associated with lactulose noncompliance.1,42 If 8% of those 98,673 hospitalized patients were hospitalized due to lactulose overuse, then an estimated cost of $141 million was associated with lactulose overuse. The economic burden of HE is substantial and is expected to increase given the rising direct costs of hospitalizations, outpatient care, and HE treatment in the United States. Reducing the rate of HE-related hospitalizations is an important measure which has the ability to reduce total cost of HE management. Additionally, the indirect costs of lost working time and productivity also contribute to the financial burden of this disease. Indirect costs, such as physician office visits and drug compliance, were not analyzed in this study. 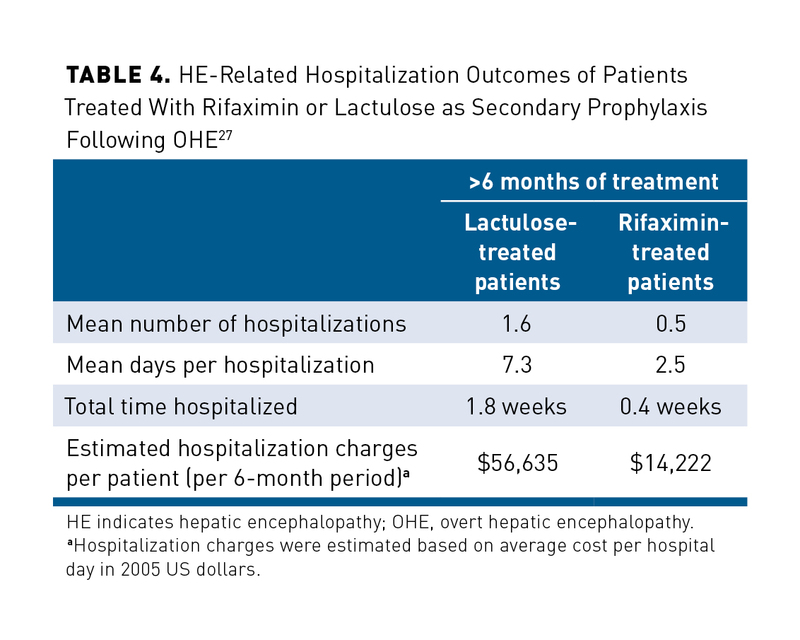 These excluded indirect costs suggest that rifaximin may offer potentially greater cost savings than calculated in this analysis.5 This study utilized charges associated with the 200-mg formulation of rifaximin in the cost of therapy assessments, where the drug cost of rifaximin is more expensive than the drug cost of lactulose ($662 vs $50, respectively).5 Notably, when directly comparing mg-to-mg costs, the 550-mg formulation of rifaximin is less expensive than the 200-mg formulation. As this 550-mg formulation was not accounted for in the analysis, rifaximin has the potential to offer savings additional to those demonstrated in this study. 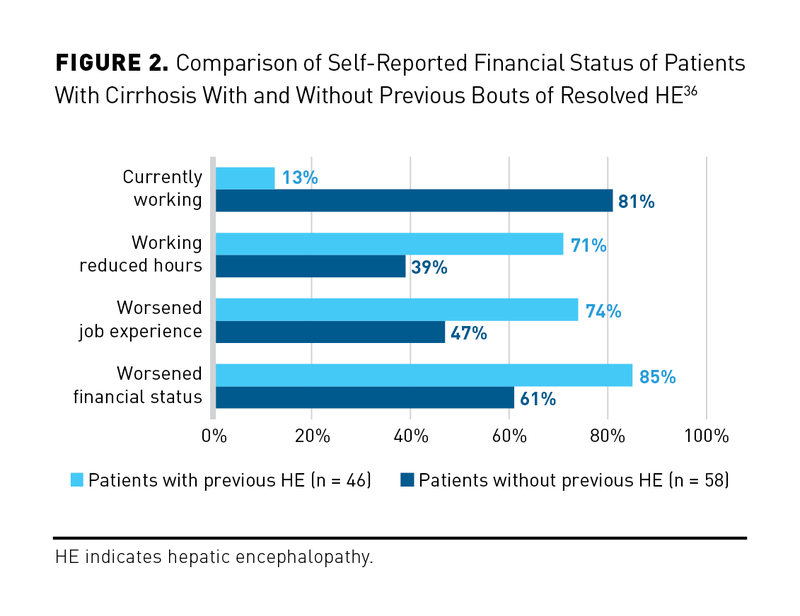 Cost-effective management of HE is essential, as the combined direct and indirect medical costs of this condition represent a large economic burden for individuals, healthcare systems, and society. Additionally, OHE is often recurrent, and each episode contributes to the overall burden of this disease. Although CHE does not typically require hospitalization, patients living with this condition may still experience associated quality-of-life reductions caused by neurocognitive and physical decline. Regarding the economic burden of medications, studies have shown that rifaximin in combination with lactulose may be a cost-effective treatment option that reduces hospitalizations and improves adherence to maintenance therapy. According to the 2014 AASLD/EASL practice guidelines for HE in chronic liver disease, rifaximin is recommended as an effective add-on therapy for the prevention of recurrence of OHE is patients treated with lactulose. Alternative options include PEG and antibiotics such as neomycin, metronidazole, and vancomycin. While these agents have been historically used for HE treatment, they have fallen out of favor due to limited recent studies and a relatively poor risk–benefit profile. At present, rifaximin therapy appears to offer greater potential efficacy, safety, and cost benefits when compared with lactulose through its associated reduction in hospitalizations, enhanced patient quality of life, and improved adherence attributable to a favorable AE profile.